This latest project transforms the physical relationship between banks and its customers. We worked with CYBG to establish the concept B Works, which formed a new type of banking environment with a financial lifestyle space inspired by the notion of Learn. Work. Bank. Responding to the latest needs of SME’s, business owners and private customers that have shifted to digital banking – together, we decided to turn the traditional in-branch experience on its head, and into an innovative and inspiring journey. Not Just a Bank, But a Destination. Since its opening in January this year, B Works has received very positive feedback from visitors. Along with people calling the space inspiring, many freelancers and entrepreneurs have been praising the co-working area and the various initiatives, courses and free events. CYBG challenged us to design an innovative destination with an energetic and inviting environment, where customers can receive expert financial advice, training programmes and classes including digital skills courses, fitness and yoga sessions. The project began with a workshop to understand B’s vision, positioning it as a brand that balances the needs of its clienteles’ businesses and lifestyles. B WORKS’ is a shared environment that facilitates communal learning, working and banking, where new ideas can be generated and shared. From this basis, we developed a contemporary and familiar-feeling branch, designed with the customer’s experience in mind – with a variety of amenities not typically associated with the banking experience that aimed to inspire customer interaction. We designed a flexible and multi-purpose space, which drives engagement and initiates socialising through interactive events and activities. This includes a number of hospitality areas, such as a café with a multifunctional bar with banking staff to help customers with their financial inquiries, all within a friendly and informal setting. The environment we created also motivates customers to explore new opportunities across multiple platforms. Along with event spaces that can be used for social learning and entertainment, it includes a retail exhibition space in partnership with a global fashion brand Boohoo, introducing a new and fresh feature to the banking environment, and showcasing the ways in which B bank can assist with local business growth. A bank not as you know it, but a new type of banking environment; a financial lifestyle space, that inspires forward thinking. This latest site also has a large and sophisticated co-working space, with semi-private meeting areas and shared wall spaces, allowing business and entrepreneurs to collaborate and network. The interior configurations bring the idea of Learn. Work. Bank. to life and are accompanied by a modern tone of voice, a distinctive colour palette and branding that embraces a confident and relatable aesthetic. 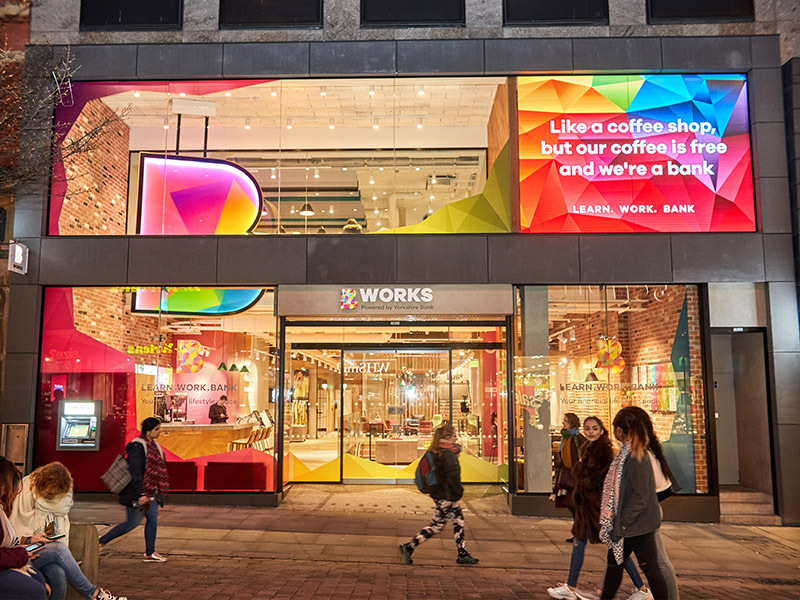 This warm, open look and feel that is the new Manchester site evolves the B brand, by differentiating them as more than just a bank, but rather a place where customers can collaborate, learn and create when it comes to their own financial lifestyle.